Sure, we wore them at our high school graduations, but picking up our graduation gear in college seems so much more important. Once you have that enormous gown and the mortar board cap, you’re pretty much ready for that diploma. Naturally, of course, at least 20 of your friends will feel the need to post something about it, so get ready! 3. 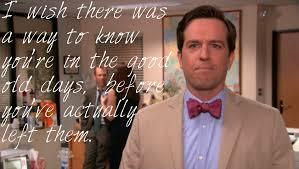 Nostalgic status about the past four years. 4. Congratulatory posts from friends and family of graduates. 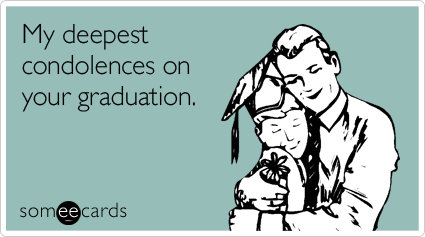 Let’s not forget about your friends who aren’t graduating! Those friends will mainly be posting congratulatory statuses and perhaps photos with someone they know who graduated, but they are just as wrapped up in the Facebook madness as those who have graduated. Usually with great achievements come great support, so look out for those tagged posts on your news feed as well. 5. Photos of everyone in front of the same buildings and university landmarks. As much as I enjoyed taking my graduation photos, I’ll admit that plenty of them had cliché written all over them, and I wouldn’t have it any other way! At every university, there are certain iconic buildings and landmarks that everyone will want to take a photo next to, so prepare yourself for multiple pictures with the same exact backgrounds. At my university, we are only allowed to set foot in the pond outside the library during Homecoming, so naturally I (and everyone else I knew) had to take pictures standing in the pond in my cap after I was finished with graduation! What sort of posts have you come to expect from graduating seniors? Link Love Wednesday: Soviet Playgrounds, Nutella and More!